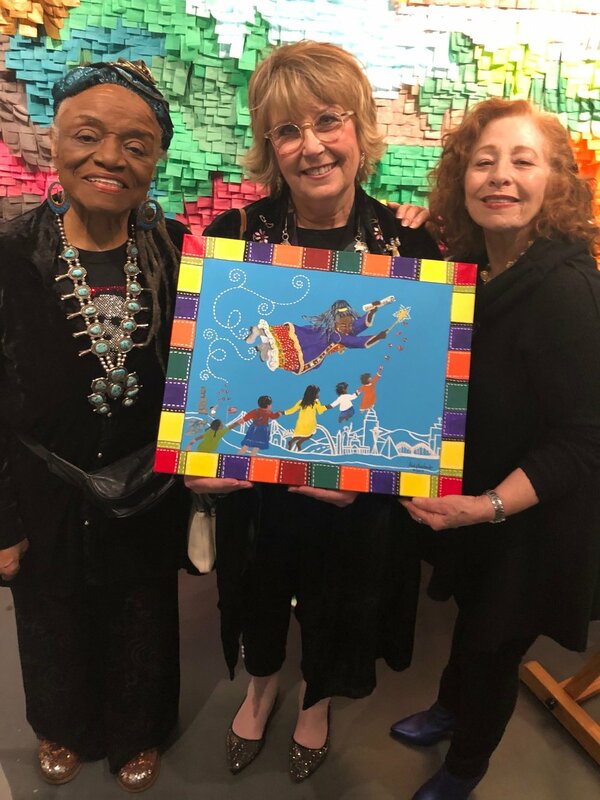 Faith Ringgold, Melody Weintraub and Nancy. Please do not use without permission. I’m just returning from an amazing trip to New York City. I came to attend Faith Ringgold’s “Anyone Can Fly Foundation’s” benefit (http://acffessay.blogspot.com). It was held at the Sugar Hill Children’s Museum of Art and Storytelling (https://www.sugarhillmuseum.org) in Harlem. That’s the district of Harlem where Faith grew up. Other artists grew up there too, but we didn’t learn about them in history books. Instead we learned about European artists and rarely about the avant garde. They all made nice art, but we missed so much. Faith has made it her mission to include more artists of African Diaspora in the Canon of Art. Now we know that artists of color have been making powerful works of art for centuries. Faith’s foundation wants to make sure that our school children know that great art was not created nor does it need to be created in a bubble. Faith has taught me to fly. She empowers everyone around her to reach for the stars. Why not? I painted a painting for her event. It is of her..flying..spreading love all around her, but especially to the children. She really loved it and I’m so happy that I could donate it to her mission. We took a picture together with the person who bought it. Before I left the event, Faith looked at me straight in the eye and said (with a fist bump), “It’s really a wonderful painting, Melody.” At that moment, I felt my feet lift the ground. In what ways do we inspire our students? Do we demand a little too much sometimes? Are we afraid to stray from our own agendas? Do we spoon-feed our own ideas to them? Or do we help them to express their own voice and solve their own art problems? Do we teach them to fly? Or do we pull them down? Sometimes, all it takes is a positive word..a note of encouragement..or even a fist bump..and soon they’ll be reaching for the stars! I ought to know…. Photo of NAEA 2019 crowd before hearing Howard Gardner. Photo by Melody Weintraub. Do not use without permission. I just returned from the 2019 National Art Education Association (NAEA) Convention in Boston, where over 6,500 art teaching professionals and leaders in education convened. I went to learn and to present (an altered books studio workshop) and to hang out with friends. Before I left Memphis, my amazing principal gave me her blessing and said, text me if something really cool happens. Well, here it is. However, this story is a little long for texting. Sorry for the length, I just can’t leave out any of these details. Howard Gardner presenting at NAEA 2019. Photo by Melody Weintraub. Do not use without permission. Photo by Melody Weintraub. Do not use without permission. When I looked at my wedding engagement ring, I saw that my diamond was gone! I panicked, jumped out of the chair dumped my purse contents on the floor in a desperate effort to find my diamond. Nothing. I walked over to a table to empty the contents of my convention bag. Nothing. I looked on the floor as I walked through a café I had visited earlier. Nothing. Then I remembered that I had been to the women’s restroom earlier..oh no, the sink! I rushed to the sink upon the advice of someone who saw me searching. Nothing was in the sink, but could it be in the drain? Or stall? While I waited for someone to leave the stall, I called my husband back home in Tennessee to let him know I had lost my diamond. His reassuring words made me even more emotional...about how he loved me more than the diamond..he would buy me another...not to cry...it’s just a thing…But I responded that I wanted that diamond...not another. It was that diamond that he had worked all summer 40 years ago in sweltering heat at a loading dock to pay off before we were married. It was that diamond that he chose from a tray of diamonds the jeweler had offered. It was that diamond that I saw for the first time when he asked me to be his wife. At this point, I’m sobbing and art teachers I don’t even know hear me and are coming out of the stalls to comfort and reassure me...also my dear friend Janis Nunnally was there..just when I needed her organizing, thinking, and problem solving (like any art teacher would). This group of art teachers reassured me by reminding me that they were, “visual people.” “If anybody can find it, we can!” We then looked in the stall, it wasn’t there either. One of the art teachers I didn’t know, even got down on the floor of the stall to look for it. A humbling sight I will never forget. We then approached the security desk, asked them about removing the sink trap to see if it had fallen through. I felt there was a strong possibility that it was there, but we had to wait for a facilities manager to get the right equipment. So, I kept searching until that could be done. At this point, others surrounded me...mostly art teachers..caring, hugging, weeping. They tried reassuring me, I told them that I believed that everything happens for a reason, and that maybe someone would find it who needed their rent money...That would be more important than my sentimentality, I suppose. Still I continued to retrace my steps, pausing where I’d had a conversation on the phone with my friend. Then pausing at the desk where I’d inquired about the convention and then on to a trash bin where I’d thrown away my coffee cup. At this point two guards willingly took the trash bag out of the public trash and took it to a back room to sift through the garbage. I cannot say enough about their concern and empathy. Boston’s finest. While they searched, I continued my way up to the elevator I had ridden in earlier, hoping it would be stuck in the corner…Nothing. Exiting the elevator, I made my way back to the auditorium where 3 hours earlier, I had experienced the highlight of the conference. Another smaller presentation was in session. The lights were dimmed except for the presenter’s spotlight. This time, I was not drawn by who was speaking on the stage. I was genuinely focused only on finding that diamond. I walked as discreetly as possible to the place where I had sat earlier, scouring the floor as I walked. When I got to my seat, an art teacher I’d never met, Rebecca Belleville from Baltimore, Maryland, was sitting there. She kept her seat but moved her things over so I could sit next to her, not knowing, of course, why I’d come to this presentation. I sat down and motioned to my empty ring. I mouthed, “I’ve lost my diamond and I was sitting in your seat earlier.” Her expression was priceless. She gasped a little, “Oh no!” At that point she joined me in looking on the floor from our seats as quietly as possible while the presentation was still going on. Then as graceful as a swan, she reached down to the floor next to her chair, picked up the diamond and simply handed it to me. We were both stunned, so stunned that I had to sit there for a moment or two to let it all sink in. We then we wept together. I thanked her profusely and left the auditorium to go back and get word to everyone that the diamond had been found. In reflecting on this miraculous experience throughout the day, my thoughts went to community of people who’d helped, who took the mission of finding my diamond as if it were their own, from the amazing art teachers, to the security staff, to the man who was about to shine my boots. He was, perhaps, the most elated. Maybe it will become his favorite story to tell others as he shines their shoes. Maybe it will give them hope when other more serious situations are dominating their thoughts. Then my thoughts went to what that diamond represents. The child who is lost. Lost in a world where he/she does not quite fit in. Fallen from a setting that seemed so perfect into a crowd filled with people who walk by with other agendas, like me sometimes, even ignoring the missing, the lost, the “misfits.” Or worse, believing that they are a bother to our plans--to our perfect “setting.” During all of this, someone had asked me if the ring was, “insured,” an honest question, but the value of the stone to me was much greater than any appraised value. It was never about the ring, anyway. It was always about the diamond. Mother Teresa said, “I alone cannot change the world, but I can cast a stone across the waters to create many ripples.” If everyone focuses on their own personal agenda, they will miss the opportunity to be part of something truly wonderful and fulfilling. As a community of art teachers and leaders in education, we are the ones who seek out and rescue those “diamonds in the rough.” They are precious to us. We find them and give them a safe place for personal expression. The art room is the setting where they find a place to shine. After all, we are visual people. If anyone can find them…we can! Cartoon Drawing by Melody Weintraub. Do not reprint or post without permission. There’s this picture. I had just begun my first year teaching Middle School Art, back in 2000, when my administrator asked who was interested in getting some professional development at the National Middle School Association Conference and Exhibit in St. Louis, I think I was the first person to raise my hand. Road trip! I was so excited about learning how to better reach middle school students and I was really excited about getting to go to some practical sessions to learn new media skills and techniques for the art classroom. Although I did get to hear Harry Wong speak (highly motivating) and Paul Stookey sing (Peter, Paul and Mary), and although I had a wonderful time with my colleagues (Math, English, Science), I was disappointed to learn that there were no workshops or applicable sessions specifically geared to Middle School Art. I wasn’t interested in returning, but what I was interested in was finding a convention that better matched my field of study. So, I began asking around and eventually, I was lead to the National Art Education Association Convention. It was in Minneapolis that year. I didn’t know a soul. Didn’t even know about our state’s organization (found out later). But, I signed up and went anyway. It was beyond all of my expectations. My school even paid the way for me to go! I think the first thing that impressed me was that so many lessons that I thought I had “invented” were being “invented” by others as well. Every stranger I met seemed like an old friend. We laughed, shared stories and had such meaningful conversations. Then there was…. (drum roll)…THE VENDOR EXHIBIT! So many freebies and so little time! I think I had to buy an extra suitcase while I was there! Also the sessions were not only enlightening, but practical. I learned so much that I still use today. It was fun to meet new people to see how they dressed and to learn how they teach art. I had found my peeps. I knew that I wanted to become more involved, so I got involved with my state organization (Tennessee Art Education Association) as well. Next January, I will be signing on as President of TAEA. Funny how a little PD trip to St. Louis can change your life! As I write this, I’m packing for the NAEA Convention in Boston! I will see my peeps. As a state leader, I will attend Delegates. I will learn new things. I will see old friends. I will meet new friends. I will present my lesson on Altered Books and I will fly back next Sunday exhausted and rejuvenated. What a great way to spend Spring Break…with my peeps. You may or may not know that March has been designated as Youth Art Month. If you teach art, you probably know. But then, every month is Youth Art Month to art teachers. It doesn’t just begin in August and end in May or June, as some would like to think and snidely remark, “Who wouldn’t want that kind of job…” What they may not know is that our summers are usually reserved for workshops, gleaning ideas from magazines and YouTube, and planning. Art Teachers’ families and friends just have to understand that we may be on the beach with them somewhere, but we’ll probably be picking up shells to bring back to school. “By the way, are you seriously thinking of throwing away that bottle cap?” Our job also doesn’t start at 8 and end at 3. Most art teachers spend hours and hours of planning and cleaning, sorting and scraping, displaying and grading long after other teachers have left the building. But then the custodians (who we try to make our best friends) are usually nice enough to watch us walk safely across the dark parking lot to our cars. Some of us work in environments that appreciate what we are bringing to the students everyday. I am blessed to work at a school that continually supports my profession. However, many Art Teachers go unnoticed, unthanked and overlooked by their colleagues and administrators. It’s heartbreaking to read posts where Art Teachers talk about how they feel undervalued. So, why do they do it? Why not give up? Because they chose a profession that has intrinsic value every month and every day. Because some art teacher somewhere along their art journey changed their life through art. Because they were lost and they found an art family. Because they want to find students like them and make a difference in those students’ lives. The other day, before students began working on their various projects, I distributed some index cards and a few pencils. I asked them to write on the top of the card, “Why Art Matters to Me.” I then asked them to write why art matters to them, personally. I told them not to write what they thought I wanted them to say (they can be such teacher-pleasers). They took this seriously. Some even stapled some cards together. They had so much to say. Most of them said that art helps them to express themselves in ways that they can’t express in words. (However, they did a pretty good job communicating through the cards)! I think that giving them this opportunity helped me to understand that art opens up communication. What a gift to know that my students feel safe to express themselves in my Middle School Art Classroom! And that, my friends is worth every late night at school. It’s why I love where I have chosen to spend my time. Because long after I’m gone, there will be a fingerprint or two left behind. And that is why, #VisualArtsEdMatters . The Legacy by Stanley Bleifeld. Do not use photo without permission. As art educators, we often hope that what goes on in our classrooms will spark or fan the flame of a future Ringgold, Picasso, Kahlo, Haring or Van Gogh, but how often do we consider the art legacy we are nurturing among our close friends and family? Let’s not discount the impact that our passion for the arts can make among those closest to us. My first art lessons came from my dad at the dinner table..drawing cowboys. He was a maker. Shells gathered on vacation became a mosaic on masonite scraps he brought home from a construction site. He built step stools for all of his nieces and nephews. He loved decorating for Christmas and even made some of the displays. My mother and her sisters loved to sew, crochet, embroider and two of them especially loved painting. My aunt Sibyl had a beautiful old cabinet filled with craft paint and a basket full of gourds, oyster shells and cypress stumps. When we came for a visit we were always welcomed to sit and paint. And then, I married into a wonderful family that valued the arts and nourished my talent. When I began painting classes in my late twenties, my mother-in-law and father-in-law were my very first patrons. They also introduced me to the work of a relative, my father-in-law’s first cousin, sculptor Stanley Bleifeld. Melody Weintraub with Stanley Bleifeld at the Virginia Civil Rights Memorial, “It Seemed Like Reaching for the Moon.” Do not use photo without permission. Knowing Stanley had a huge influence on my career. As soon as Stanley knew I was taking watercolor classes, he and his wife Nicky shared a book with me by their close friend, Burton Silverman, a master watercolorist. Stanley always seemed like an icon to me. I only met in him in person for the first time after my father-in-law passed away in 1993, but I heard so much about him from my in-laws on their visits to his art openings around the world and visits to his studio in Pietrasanta, Italy. Life Magazine featured Stanley early in his career. Stanley’s work included the Vatican Pavillion Bas Relief at the 1964 World’s Fair, The Lone Sailor at the U.S. Navy Memorial in Washington, several statues at the National Baseball Hall of Fame in Cooperstown, NY, The Virginia Civil Rights Memorial- It Seemed Like Reaching for the Moon and ironically enough…The Legacy. Later this month, I will be presenting a lecture for the Virginia Art Education Association on the work of Stanley, specifically the Virginia Civil Rights Memorial and how his work can be used in the classroom. 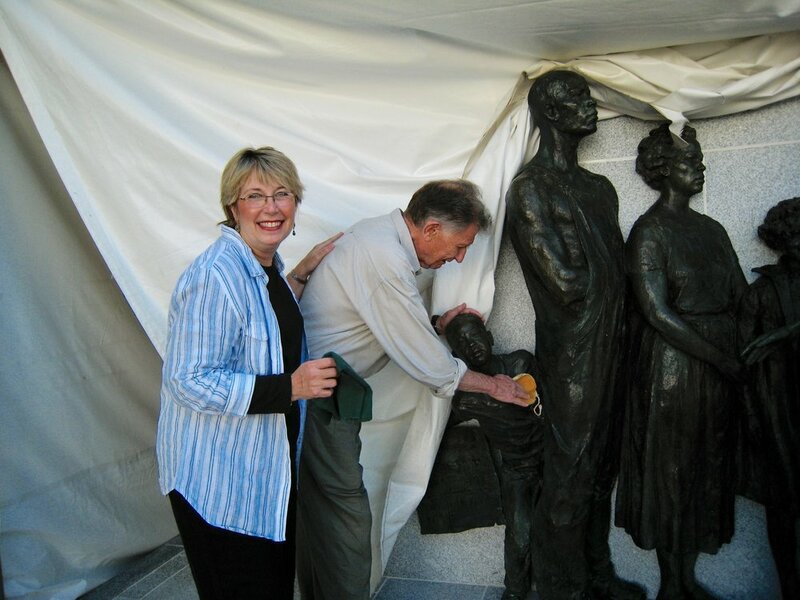 Our family had a reunion at the dedication of this monument. I have thought a lot about legacy in the last several months. Stanley left behind a large looming legacy in our family. Painting with my grandson. Do not use photo without permission. I often wonder what kind of art influence I am nurturing among my family and friends; hopefully those art camps with my children in my garage, drawing and painting with my grandson, painting rocks with my nieces and nephews at the lake house and family crafts at Thanksgiving will become more than a memory..hopefully it will become something that will transcend beyond the changing of hands for generations to come. My students are working in small groups to design a sustainable city. It’s actually an application of a lesson in linear perspective. First, we discuss the detrimental effects of things like pollution and plastics on our environment. Next, we talk about city design. We look at ways that some communities are dealing with these issues. I teach in a religious school, so we also talk about how we should be “good stewards” of this gift of our Creator. Project Manager-Facilitator who works with all members to make sure that everything is going smoothly and that the list of criteria is being followed. Bid Manager/Writer-This person writes down all suggestions and keeps a tally of what everyone needs to accomplish the task. Time Keeper/Monitor- This person is in charge of keeping everything on schedule and watches the clock for 5 minutes of clean-up before class ends. Architect- This person draws out the city that is decided upon by the group. Others may help add color, but this person does the drawing. As I walk around and observe the process of these students learning to work together, I remind them that all ideas that group members offer should be considered. It is the Project Manager’s responsibility to ensure that everyone has a voice. I also began to notice a trend. The students who were working most cooperatively, giving everyone a voice, supporting one another in their roles, seem to make the most progress in their work. In one group, a student architect “demanded” that he be allowed to just do his own job without any interference. This dispute seemed to be causing his group to make little progress. I also noticed that the other group members seemed to want to assume his role, because he didn’t want to listen to criticism or suggestions. When I pointed this out to them, I tried to speak from both of their perspectives. I reminded the architect that although it was his job to draw, his responsibility was to draw what is suggested by his group. If people do not feel they have a voice, they will try to assume your position. He understood. His group members nodded. This event caused me to think about “sustainability” in a different context and from a different “perspective.” Do we realize the importance of sustaining our working relationship with others at our schools, in our homes and in our communities? Not only do we need to constantly seek new ways to keep our planet’s resources sustainable, but since we live and work together with others who think and act differently than we do, we must work hard to move past our differences and find common ground where we can work together. If we simply focus on how others are keeping us from doing our job, then we are not open to the real possibility that others may have a significant impact on how to help us do our job better. Instead of focusing on how others are not listening to us, perhaps we could focus more on listening to them. Instead of focusing on how others are never going to change, perhaps we should focus more on the direction they are moving. Giving others a voice in decision making empowers everyone to want to engage in more meaningful conversations which may help us all focus more on a unified purpose. Above all, when we engage with others, we should do so with an attitude of respect and love. By the way, that group made some progress today. When I asked what changed, they all agreed that it was because they were having more discussions and writing down more ideas. They were being energized by one another. That would be “sustainable” energy. Shine on! Okay..I have a confession to make..I have always loved the first week of school..as a student..a parent and a teacher. The first week of school with fresh supplies, new backpacks and most of all a fresh start to a brand new year. The first day of school filled my heart with hope. I always had the sense as a student that, THIS is the year that I will pull it all together, make better grades, do all my homework, read the ENTIRE book assigned and never be late for school again. I projected that great expectation to my children as we shopped K-Mart for the coolest super-hero lunch boxes and Lisa Frank folders..you know the ones..and as the student lists unfolded before our eyes on decorated doors we entered the classroom together. I still occasionally call my grown children to see how they're doing with ballpoint pens when I see the back-to-school sales at Office Depot. Old habits are hard to break. As a teacher I have those same feelings of renewal. I want to be a better teacher this year. I want to engage my students more. I want to give them more choices and instill more independency in their art making. I want to ask more questions instead of giving more answers. I want to learn new skills and be introduced to new materials so that I can share them. I want to learn what I can do to be a better teacher. And I really feel that THIS is the year! I need to remember that my students feel that way too. So, although its a good idea to spend the first week going over rules, procedures and expectations, it's also a good idea to set aside a little time to give them a reason to want to come back tomorrow. So, on Friday of the first week of school, we set the syllabus and made a little macramé swag for their portfolios. After all, they have brand new portfolios and it's a brand new year! 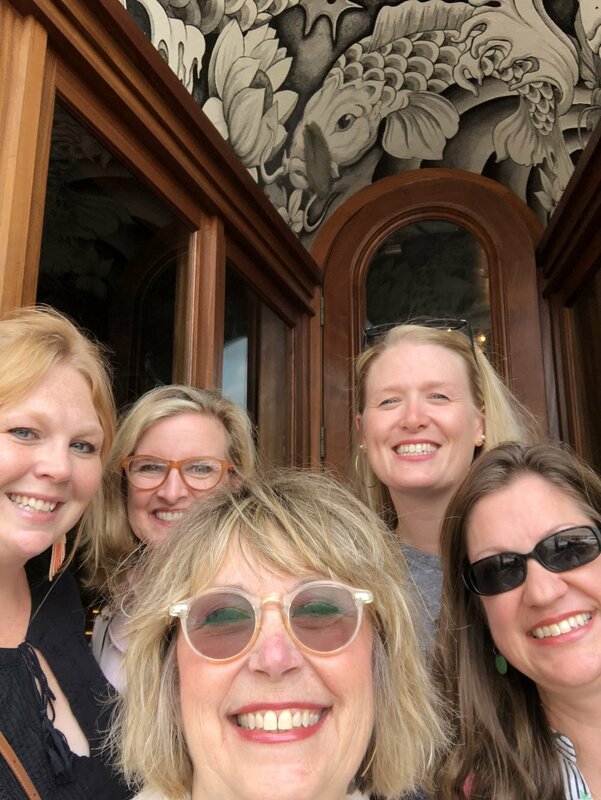 Once upon a time (this week) in a land where colorful houses dominate the landscape and the salty air smells like fresh seafood and bread baking in the oven (Charleston), a group of people (art educators) gathered to learn, play, plan and prepare (position statements) for the future. At first, some of us were a little intimidated by the list of those presenting. Then something incredible happened. Each speaker began to share their story. Soon we learned that these optimistic and brilliant people are not only transparent human beings but also very approachable. So, everyone forgot about the perceived intellectual intimidation and we all just decided to have a good old time and we ended up learning and growing. The moral of this story is, everyone has a story that always needs to be listened to and sometimes needs to be shared. TAEA President Kathy Dumlao (right) and me (left) with Derek Fordjour (center). On the first day of the conference, we heard a keynote by artist Derek Fordjour. While showing slides of his powerful work, this vibrant, articulate and Harvard scholar shared a story of his journey from his Central High School Art days in Memphis (that’s MY city!) under the leadership and impact of art educator/mentor Bill Hicks (who he still calls on Father’s Day) to the classrooms of Harvard and galleries of New York. He brought tears not only to my eyes but to many of the teachers sitting around me as he shared the story of how Bill Hicks changed his life. The next day we heard from art educator and lecturer, Dr. Patty Bode, as she shared how her journey through a mentor/teacher shaped the course of her life study in Equality, Diversity and Inclusion. But she also shared how her journey was also shaped through her time as a middle school art teacher and her work with at risk juveniles. On our final day we heard several stories by Master Storyteller, Tim Lowry. Not only did he reach us as educators through a powerful and touching story of his encounter with a student when he served as a language arts teacher, but he was also able to show us how to use the art of storytelling as an advocacy tool as well as an instrument to engage students in the classroom. But the storytelling wasn’t confined to those sessions. Throughout the day and even at small group gatherings for lunch, dinner, shopping or museum hopping, we were telling our stories to one another as we bonded with new and old friends; stories of family trips, student antics, classroom chaos and..well..just the journey of life. 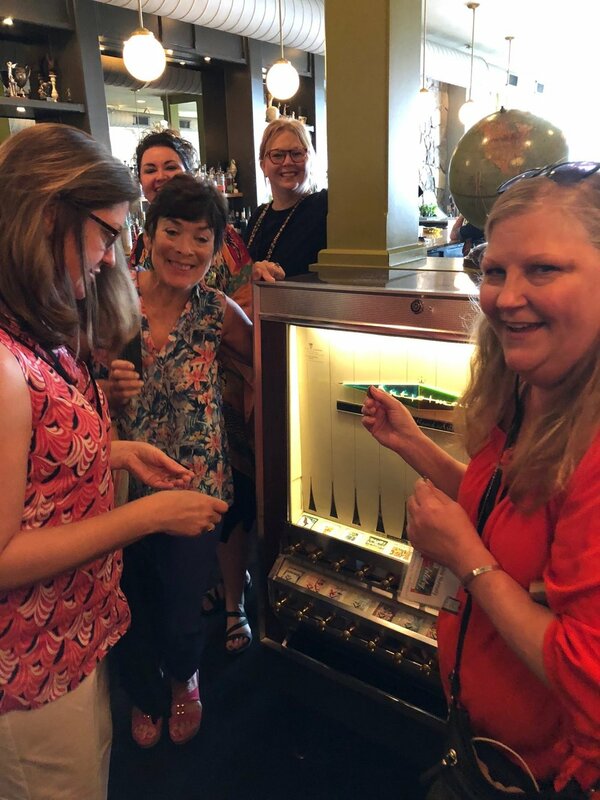 We also began the process of creating new stories from new memories (like a visit to the Art-O-Mat) from a few days in Charleston together in the summer of 2018. A trip that we will not soon forget. I’ll tell you more about it sometime, if you are willing to listen. With friends at the Gibbes Museum in Charleston. Share Like An Art Teacher! Debi Dunavant West and me at NAEA18. Debi Dunavant West has a saying she uses quite a lot, "Together We Art Better." She ought to know. She has received numerous awards for teaching including Georgia State Educator of the Year (2009) and National Elementary Art Educator of the Year (2005). There are more. Her students have received numerous awards as well. She is a powerful speaker/motivator. She also writes for several national publications. Debi believes in sharing. I do too. Early in my art career, I was hesitant to share. Probably insecurity. It followed me early into my art teaching career. Not sure why. I guess I thought that I wanted to be the only person with such a great idea. Which in itself is a bad idea. 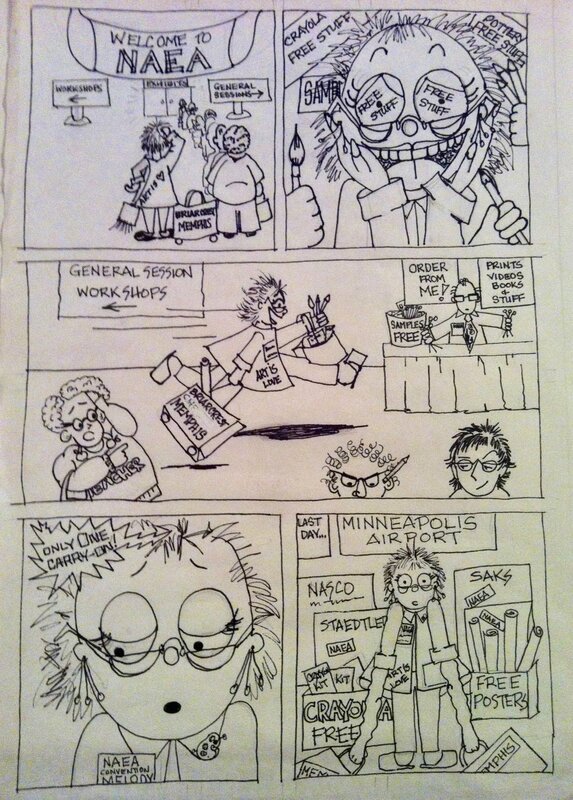 Then after attending my first NAEA Convention, I realized that I was indeed NOT the only art teacher with good ideas. (Someone else designed cereal boxes? Really?) I was amazed at how freely the presenters shared what worked for them. That inspired me to "grab" what I could from others and give back what had worked for me in the classroom. 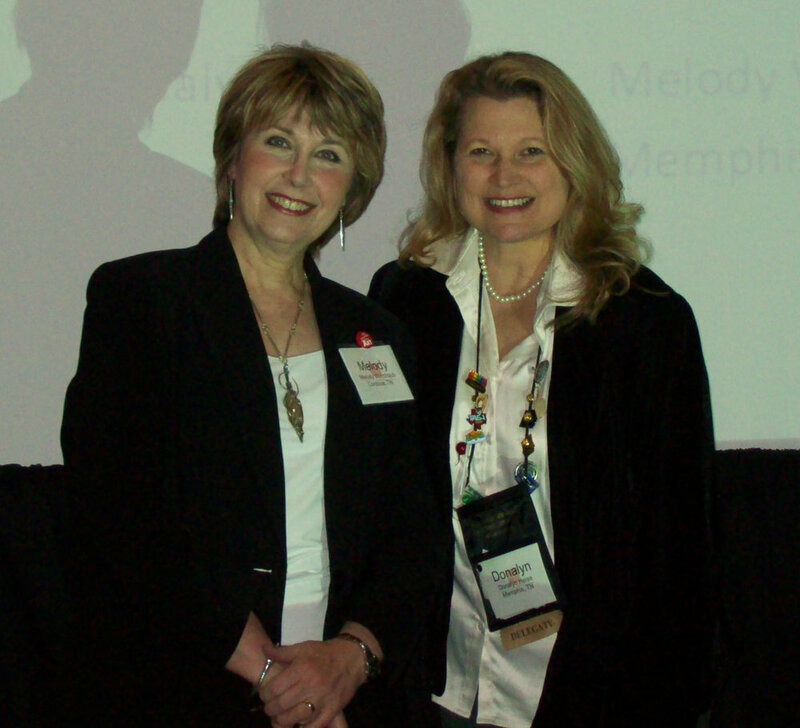 Donalyn and me Co-Presenting at NAEA Convention in 2009. Then in 2007, I was recruited by The University of Memphis to teach Art Education. Sharing became a way of life for me. It became the kind of giving with no regrets. My colleague at the university, Dr. Donalyn Heise modeled that kind of giving for me. Knowing that what I had learned, lessons that rocked, methods that motivated could be multiplied into the classrooms of others was exhilarating! When I returned to the classroom, I was then able to use my own advice, tweak some old lessons and create new ones, based on the feeling that what I was doing could be shared later with others I sometimes mentor. That's also where this blog came from as well as my YouTube Channel demos. Nancy Walkup and me at NAEA 18 SchoolArts Vendors Booth. Writing has now also become a way of mentoring. I primarily write for SchoolArts Magazine. This has been a wonderful way for me to share and also inspires me to create new lessons, try them out and then write about them. I take lots of high quality images of students working, as well as photos of materials set up and products. When I know that I might write about it, I send out media permissions for parents to sign, so I'll be ready to submit. If you have a great lesson, that's never been published, I highly recommend that you submit the lesson to a publication like SchoolArts in order to share it. Nancy Walkup is the Editor. Here is one of the latest article I had published. It appeared in the March 2018 issue which was distributed at the NAEA 2018 Convention in Seattle. Enjoy and uh...feel free to Share Like An Art Teacher! 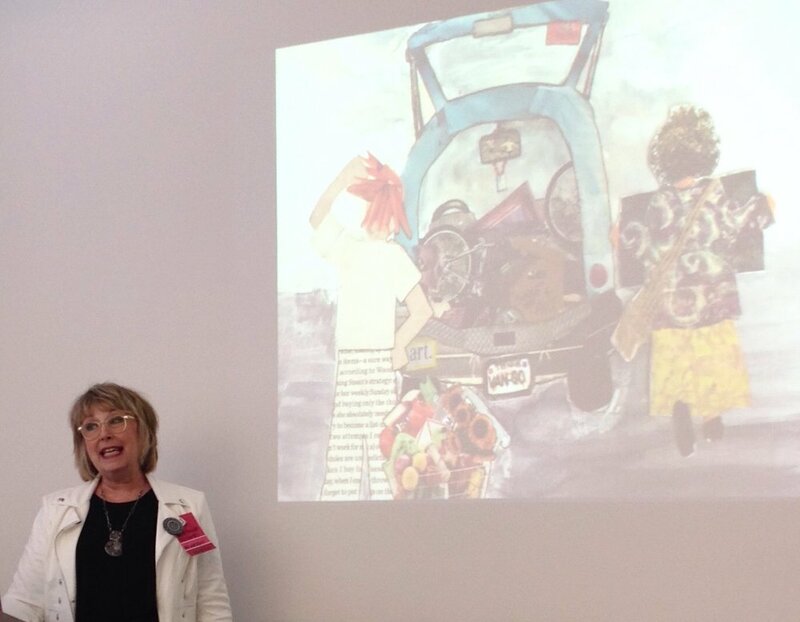 On May 30, I delivered a Keynote Address to the Middle Tennessee Art Teachers at The Frist in Nashville. This was not my first presentation, but it was my first keynote. For weeks I deliberated over what to say and how to say it until I was reminded that it might be better to think about what those teachers needed to hear at the close of the school year. Or as a retired teacher-friend reminded me, "Remember, Mel, they are exhausted." Once I focused on them instead of myself, everything fell into place. Here are a few excerpts. If you are a teacher too, I hope it will uplift and encourage you. Today I'd like to explore two basic questions: 1) How can we motivate students? and 2) How can we motivate ourselves? We are, at times, oceans apart from our students..socially, demographically, emotionally…We don’t always know what’s going on in their heads or their lives..we might THINK we do. And we also probably have no idea how much it means for them to come to art. Art class for these students can be more than a place where they learn about the Principles of Art and Design, or where they learn to identify masterpieces, or where they learn skills, techniques and methods. It can be more that a place where they learn to draw..forms. Don't get me wrong, these things are important but they cannot be all that we teach anymore. We have to help students utilize these tools to make connections and respond to the world around them. Can we make students LIKE art? No. But we can design lessons where their concerns are addressed and where they feel connected. Can we make students HATE art? Absolutely. Isn't that scary? However, if we give students more choices within their lessons, and if we design lessons they can relate to, art class can be that place where they feel safe to express their own uniquely wonderful voice. How can we motivate ourselves? 1) Find an Interest (unrelated to teaching). Not only do we need a break, but it will make us more interesting as teachers. 2) Find a Workshop. Learning new skills and techniques always seems to rejuvenate my teaching! 3) Find a Group. Following a positive professional group of art educators via social media or meeting for coffee or dinner regularly makes for meaningful dialogue and can be a springboard for new ideas. A few weeks ago, I commented on a post by a discouraged art teacher. What I said to her, I'd like to say to you today. I’d like to say how much I appreciate everything you do EVERYDAY for your students. I appreciate all the worrying, planning, lifting, stacking, measuring, pouring, monitoring, CLEANING, distributing, listening, caring, inspiring, questioning, reading, writing, assessing, drawing, painting, printing, sculpting, installing, emailing, classroom managing, and teaching you do every single day and the next. I appreciate all the projects you bring home because there’s just not time enough in one day to breathe. I appreciate all the Friday’s you work until it’s too late to go to dinner with friends. I appreciate your choosing to become an art teacher..your students’ lives are different because of YOU! You don’t make it different by teaching stuff. You make it different by showing up and unlocking a door. That door just happens to be to your classroom and it just happens to be to their imagination. You make it different because you bring them to a place where they can express how they feel about what's going on in THEIR world. ..and for 45 minutes they might be expressing how they feel about these problems or they might just be able to process them..as they work on getting the textures just right on that collograph or fixing the crack in their ceramic slab or altering the pages of an old discarded book..or gluing snowflakes on a piece of blue construction paper. So, when they take a little longer on projects, maybe it’s because they're still working on some deeper issues...But that student who has faced those challenges this year would probably tell you, “Maybe I didn’t always show it, or tell you, but Art saved my life this year. Some days, it is why I even showed up for school. You called me by name, and you saw potential in me. I saw my friends feel better about themselves not because of art, but because of you." Thank you, Teachers. Have a great summer! As we close in on the last days of Middle School Art, I watched my 8th Grade Students graduate tonight. This is the first class of Honors Art Students who I have seen for 40 minutes every day all year. I have taught most of them since they were in 6th Grade. In those days, I only saw them every day for 9 weeks. As I watched baby photos of them flash across the screen in the auditorium, other pictures flashed through my mind, that no one else could see. Pictures like them working on designs for shoes they would make of clay connected to a real world problems they wished to "stomp out," pictures of them helping a fellow student work through some composition issues in a painting, pictures of them laughing and joking and refocusing on the grid drawing that would never end..literally, pictures of them receiving recognition after pouring themselves into a project. Then there is the picture of the student who suddenly seemed stunned at his own successful drawing when he stood back away from it. He had been so focused on getting the tones just right by looking at the reference photo, that he never stood back to see all that he had accomplished! A "Wow" moment not only for the student, but for his tearful teacher. Sometimes as educators, we need to stand back a little too. We can get so focused on meeting deadlines, worshiping the curriculum, managing details that we forget to pause, take a breath, step back and enjoy what our children are accomplishing. We need to remind them of how much progress they are making. But then, when it's all said and done, it's probably not the progress they will remember, nor the clay shoes, nor the gradient scale, nor the..grid drawing. Now they might remember something about "what's his name" that painted "what's her face," but what they will definitely remember is how they felt walking into the Art Room, and how the Art Teacher, Ms. So-in-So, made them feel about art. I would like to think they learned a little bit more about composition, shading and painting, but more than anything else, I hope they recall feeling loved and accepted in my classroom. That feeling has the power to take them wherever they want to go and is definitely worth remembering. Some people make art daily in their lives. They are not necessarily art teachers or professional artists, but they make everything around their lives more beautiful by just living. A little illustration on the outside of a box you get in the mail, vignettes around their home, the way a table is set or food is served, and the list goes on. Several years ago, a dear friend and mentor, Lynda Letey passed away. When I went to her home in Phoenix after the service, I was especially touched by a little table next to her favorite armchair. Nestled on the small table, was a perfect basket filled with colored pencils and brushes, and beside the basket and her Bible was a sketchbook. I thought back to all the lovely notes I had received from her that included her illustrations which have always been treasures to me. We tell our students that in order to improve their art, they need to make art and keep visual journals outside of the time they spend in the art classroom. But how many of us practice this as well? “Use it or lose it,” is a mantra that also applies to art educators. I know that unless I have an upcoming exhibit or a teaching workshop, I am spending little time in my studio upstairs and more time in my favorite chair watching British mysteries on Netflix with my family. So, I decided to set up a portable studio next to my chair, so that I will practice what I preach to my students. I keep an assortment of supplies accessible, such as my Windsor Newton Travel Palette, a small jar of water, an inspirational magazine, an assortment of brushes, markers, drawing pens, colored pencils, drawing supplies, a set of watercolor cards and envelopes, a small pad of watercolor postcards and my sketchbook. I use images that I have taken on my cell phone for references, work from a small still life, or I just paint designs. Sometimes, I keep these small studies to send as cards to friends and family or to frame and give as gifts. One Christmas, I hand painted 350 Holiday cards and at our open house, I let everyone select a card-size painting as a parting gift. I am finding that the convenience and accessibility of these supplies inspires me to build a healthy habit of making art every day. And every day, I am reclaiming a personal love for making art. This enthusiasm cannot help but trickle into my teaching. Sometimes I will share with students what I am painting from this little nook. Hopefully my practice will inspire them as well to make art daily in their lives. 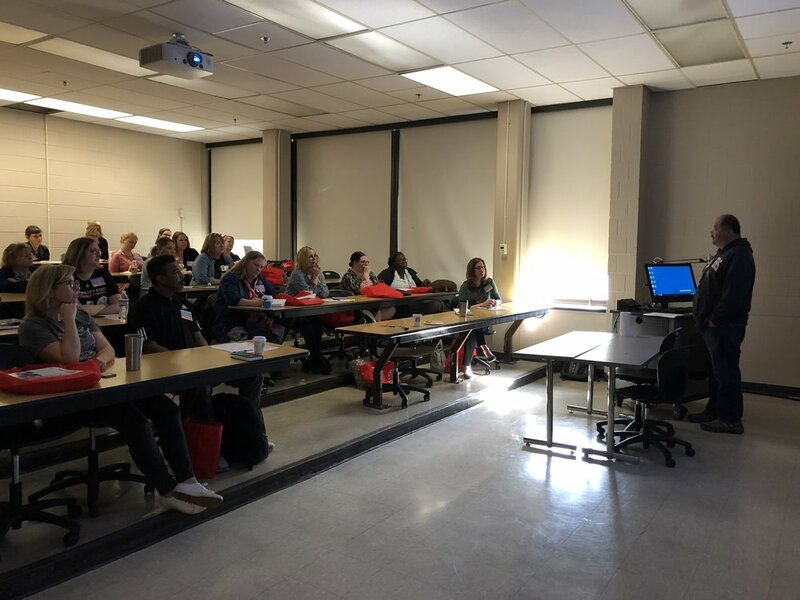 "Art That Builds Community," was the theme of our West Tennessee Art Ed Spring Conference yesterday at The University of Memphis (UM). Our Keynote address was given by Richard Lou, UM Art Department Chair. He started his talk by first commending the group for choosing to teach art. He then shared the impact that those who taught him about art made on his early life. Next he took us on a visual journey through a project he was part of in the early 90's, "The Borders Sutures Project, " where he and a team of artists traveled the boundaries between Mexico and The United States placing large iron staples in the earth between the borders to make a statement about healing. I was emotionally impacted to see the power of art to communicate a message so passionately and peacefully. It impacted me on multiple levels. "Ceramic Cherub," glazed by Ruth Hryhorchuk (circa 1968). Photo by Melody Weintraub. The healing aspect of the project reminded me of the ways that I have witnessed art being used therapeutically as people I know have faced adversity. I recalled how my sweet mother took a ceramics class in the late 60's as she went through cancer treatment. I thought of the oil painting class my mother-in-law and I attended when her daughter passed away. I think of countless individuals who took my community watercolor classes to "escape" life changes. I think of how art has been my healing balm time and time again. Even my children's book, "The Little Bluebird," began as a personal memorial gift for my dear friend after the loss of her young son. Some of the most powerful and memorable art in the world was created out of a need to make sense of life. "Broken," by 8th Grade student. Photo by Melody Weintraub. Then my thoughts turn to the staples from "The Sutures Project," and how staples hold things together to keep them from falling apart, as Richard said, "So that the healing can begin." I teach middle school, so I have always seen my role as an educator more as a directional guide as students face the crossroads of life. However, after hearing Richard's talk and seeing the staples, I see that as art educators, we are also the staples. The art classroom can be that place that is the constant for these students, the stability through the instability of life. The safe place where students can reflect and express their emotional responses to the situations they face. Art class can be the constant until the healing can begin. As a teacher in a religious school, I can remind students of their faith that transcends any temporal issue. Or as Dr. Martin Luther King, Jr. so eloquently penned, "Faith is taking the first step when you don't see the whole staircase." But all art teachers can remind students of the power of art to express, to heal and to make a difference in a world that at times seems like it is falling apart. Perhaps the best way to remind them is to model this in our own lives and to never underestimate the power of staples. I recently came across this photo of a cowboy drawing my Dad did on a chalkboard. Above it, he wrote, "I love you, Rutho," which is what he called my mom sometimes. All around the cowboy drawing there are messages to him from my children who were in elementary at the time. Sweet memories. I still have the original. As a child, I remember sitting at the table with him after supper in our in our Southeast Texas home, learning to draw this cowboy. His lines were simple, yet definite, sharp and confident. Much like my Dad. He must have drawn this guy hundreds of times. He taught me how to draw him step-by-step and there were variations of this guy..sometimes he had a beard or mustache, but basically he was the same, and always facing left. I wish I had some of those early attempts at this cowboy. He taught my children to draw him as well. My Dad inspired me to draw more and more and one day, my Dad would become the inspiration for two of my paintings. My first watercolor portrait (a sepia study) was of him and then there is the one of him in his boat gathering oysters, "Gettin' Ready to Get 'Em," which was what he said when he saw it. "Gettin' Ready to Get 'Em," by Melody Weintraub. Watercolor. Please do not reproduce. "The Fisherman," by Melody Weintraub. Watercolor. Please do not reproduce. My dad had a very artist soul and he loved to make things, like pictures from shells, step stools (he created his own pattern) and during his time in the service, he bought an engraver and would salvage plexiglass to engrave bracelets and etchings to send back home to my mom. Sometimes he would also engrave large seashells. These are all precious to me now. But none more precious than the memory of first drawing that cowboy with my Dad. Later I would become an art teacher myself and during my days teaching elementary art when I wanted a lesson on line and texture, I would pull out a lesson I learned long ago. Meet Tex. Perhaps you can share it too. But please, give my first art teacher the credit. 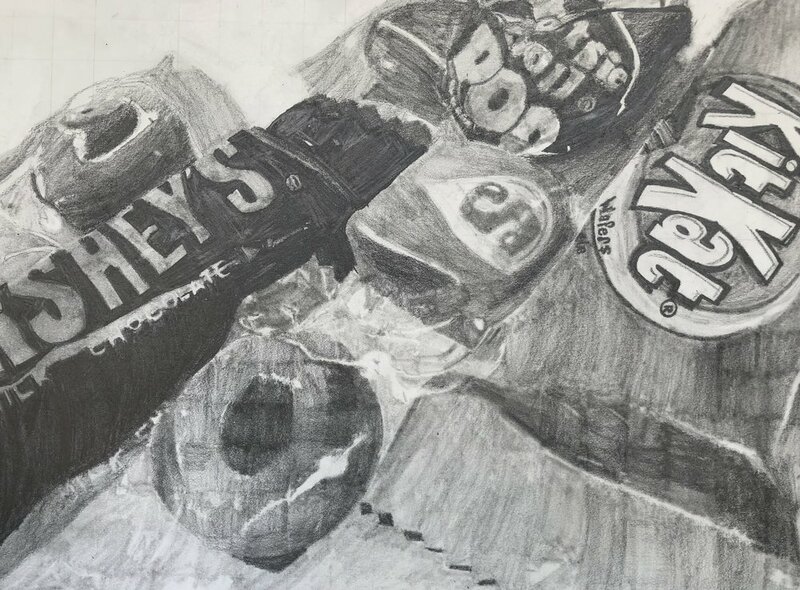 As we approach the last couple of months of the school year, my 8th Grade Honors Art students are working on a grid drawing of an assortment of candy. This project began as a photo project which began as a composition project. Since I love to weave "choice" into my lessons whenever possible, I asked students for a list of candy I should buy for this lesson. They complied. Imagine that! After I supplied all of the delectable delights Walgreens had to offer, students were instructed to choose an odd number and variety of candy, and to position the candy in a random fashion on a piece of white paper. Next students were to take a cropped photo of this assemblage. I spoke briefly to them about camera angles and lighting and showed them how to enhance the lighting on their iPhones. They then printed their photos out and, using a grid transparency, they made another copy of the photos. They could skip the last step, if they used a GRID App to take the photo in the first place. Next students lightly drew a one-inch grid on the surface of a 15 x 20-inch piece of illustration board. Since this wasn't the first time these students had done a grid drawing, I gave them a few tips and told them if they needed to review, they could revisit my YouTube Channel's Lesson on Drawing Using a Grid which is posted at the end of this entry. They began with a line drawing which I periodically checked for accuracy. Some of them are now at the point where they will begin shading the drawing this week, referring to the gradient scale they made back in the Fall. After students finish shading, they will add watercolor and colored pencil to complete this realistic drawing. Yes, they will add these right on top of the graphite. I have been working on this project along with the students; drawing and painting a little ahead, so that I can better guide them with this lesson. It also seems to be inspirational for them to see my painting develop. However, they are all working at a different pace. And this project is a perfect example of how students approach learning differently. Some of the students who are naturally talented at sketching, or who sketch a lot, seem to veer away from the grid and use a little “artistic license” when it comes to using the photo reference. Others move slower constantly having to find their place on the grid, while still others who meticulously follow the grid are pleasantly surprised at how well their drawings are coming together. As a teacher, I want my students to know my expectations, but I do not want to “standardize” their outcomes. I want them to learn from this project, I want them to stretch their talents and skills, but most of all, I want them to have a positive learning experience. I know that not all of their drawings will be at the same skill level. But it is my hope that each child will find something learned from this lesson that will help them with the next, or cause them to look a little closer at a work of art in a gallery, or notice how the Friday night lights effect the Tootsie Pop they buy at the ballgame. In October I was elected President Elect of the Tennessee Art Education Association (TAEA), so this year at the National Art Education Association (NAEA) Convention in Seattle, Washington, I attended the NAEA’s Delegates Assembly for the first time with our TAEA President, Kathy Dumlao. I didn’t quite know what all to expect in regards to this meeting. However, I did know that we would be handing out and receiving trinkets from all of the other states and provinces of our members. Kathy and I distributed gear-designed buttons that read, “Geared Up for Art in Tennessee.” We received everything from magnets to buttons, and state-themed snacks to branded highlighters. Some were elaborate, some were simple, but each and every one was a symbol of hospitality. 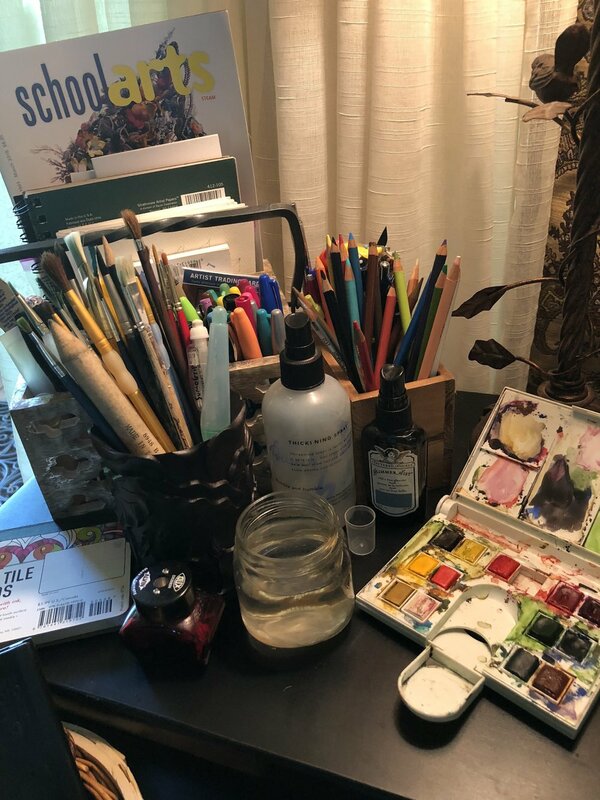 So, when I took my seat at the table next to my election paddle and saw this pile of eclectic bounty, I viewed it as the symbol of a diverse group of people with different gifts, backgrounds, and views, but driven with one united passion—to make a difference in the lives of others through art. After a series of welcome speeches and introductions by the leaders in Art Education, we were given the task of considering revisions of several NAEA position statements. After previewing these statements on a large screen projection, they were then posted on the back walls of our large meeting room. We were then instructed to review these statements again and, using notes provided, to write in any suggestions or comments. What occurred in this process was a meaningful exchange of ideas and viewpoints with other art educators from across the US and Canada. As some of us made observations, others encouraged us to write those comments and leave our mark on the wall. I remember the first note I wrote and the empowerment I felt, so I encouraged others to do likewise. Later that same day, we viewed the statements collectively again. This time, our suggestions were included in RED on the document. When I saw statements included that I had witnessed being suggested earlier in the form of a little yellow Post-It note, I got a bit teary eyed. I no longer just saw it as a wordy sterile document. I was able to attach a “face” to it. I knew the person who suggested it among a few new colleagues. And then my colleague, Kathy Dumlao nudged me and said, “Look, there’s your statement!” And so, it was included--in bright red—to be carried on to the National Art Education Association Board for a vote..my suggestion! As I walked away from this meeting and reflected on the events of the day, I realized three things; I have a voice, NAEA has an ear and policy has a face. The next day, my friends and I would tour Pike Place Market in Seattle, we would sip coffee in the very first Starbucks, eat amazing fresh Alaskan Salmon and some would visit the Space Needle and the Chihuly Gardens. But perhaps one of the most meaningful places we would visit would be a long alley in the heart of Pike Place that is simply known as The Gum Wall. Look it up. Here passersby have been leaving chewed gum for decades, out in the open for all to see. Here is Public Art that at first glance appears to be a colorful, non-objective abstract mosaic. It is strangely beautiful. What a perfect installation to reflect my impression of Delegates. We all leave our marks in the world in different ways, but collectively, there is power when we work together for a common goal. We could just focus on the things that divide us or worse, never become involved at all because we think no one’s listening. If we do that, we can be guaranteed to never move any further than our own opinionated, bitter selves, hiding like hardened gum under the desks at school. Let us instead focus on what unites us and move forward with the goal of making this planet a place where those we teach can make their own uniquely wonderful marks in the world. Just chew on that for a while. Growing up in the 50's and 60's, it was ingrained in my soul that you just don't write in book margins..nor do you ever cut or tear pages of books..at least NOT on purpose! The idea of doing those things to a book..intentionally.. always seemed somehow..really wrong. Nevertheless I knew that some of my most esteemed art teaching colleagues had found that students really love altering books. So that's why I welcomed some discarded donations from our librarian. 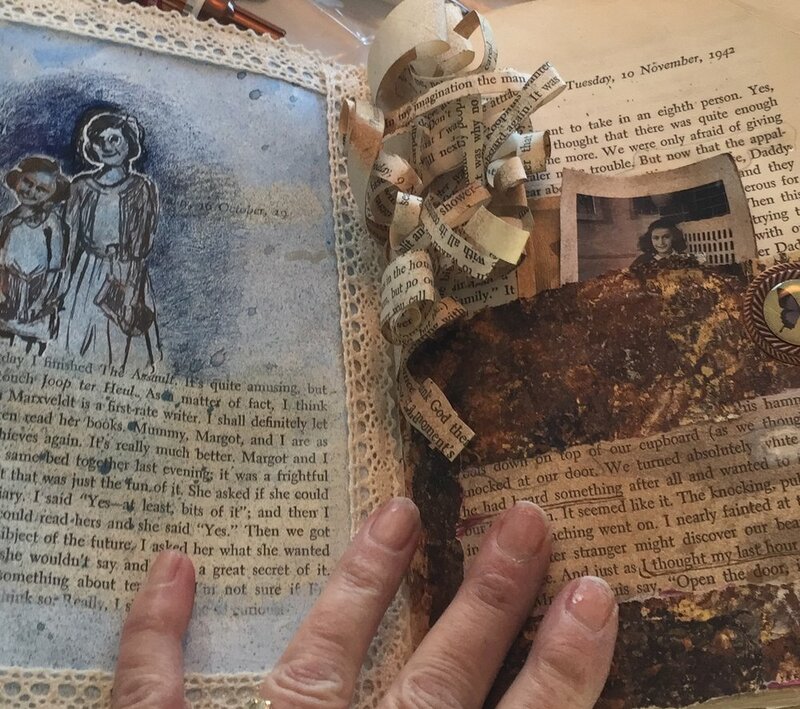 When snow was predicted to shut down our schools in the Memphis area for a few days in early January, I grabbed a copy of The Diary of Anne Frank before leaving my classroom from the pile of discarded library books and began a journey into the world of altered books. For the next few days, I moved my mixed media supplies close to the fireside in my living room and with snow gently falling out my window, I began searching YouTube videos for altered book techniques. I added these videos to our Middle School Art Class webpage and began trying them out with the Anne Frank book. Soon I was writing up a lesson for my 8th Grade students that would change the way we both look at books and stretch their talents and skills as they followed the list of criteria I designed to serve as a guide through these themed works of art. Upon our return to school, I asked them to select a book from the crate for altering. I handed them the list of criteria and showed them how to begin preparing their books for this process. As students, tore, cut, gessoed, painted, glued and charred the pages of their books they became more enthralled with the process. Their ideas emerged and soon they were independently researching subjects to include in their pages. Some took the books home to work on them and showed up after school to continue with their new-found obsession. What about me? Altering The Diary of Anne Frank did the same to my experience. I found myself wanting to read more about her and to reverently and authentically express visually with the pages what she so eloquently penned. Since these students were coincidentally studying The Diary of Anne Frank in English class, we had engaging discussions. Daily students would ask to see the progress of my book as I worked along side them. They gleaned ideas from one another and from me, but each book became the unique expression of a personal voice. I also saw them applying skills and techniques that they had learned from previous lessons while they experimented with materials in new ways. Although some have finished their books, some are continuing to find new things to add beyond the criteria. Making art not because they have to..not for extra credit..but because they want to. So, once again, my perspective has changed and I guess it's okay after all to distress a few pages from a book on it's way to the dumpster. Especially if in the process, students are finding themselves obsessed with art making and wanting to learn more. One day last week, I reflected on the variety of processes going on in just one class period in my Middle School Art Room. Students were in various stages of finishing projects or beginning new work. All were engaged..all were learning..and all were working cooperatively. Some were finishing up some AMAZING detailed drawings for our regional Scholastic Art Contest that is approaching..I isolated them a little in the room from other students who were inking and burnishing prints as I didn't want to risk an ink splatter on the tonal drawings..while other students were in the process of gouging their print blocks they were seated with friends who were still working on glazing a previous project (themed ceramic vessels). Obviously when this kind of activity is going on, students require guidance. Years ago, I experienced the value of training a few students to help others. My kids like to be called, "experts." Who doesn't? So, with this particular lesson, I have some gouging "experts" and some printing "experts." Gouging experts help their fellow students learn how to apply a reversed print design to the block and then how to utilize the different nibs for gouging and precautions to take to prevent trips to the nurse for another bandaid....While the printing experts guide those new at printmaking in the techniques needed for a clear print. 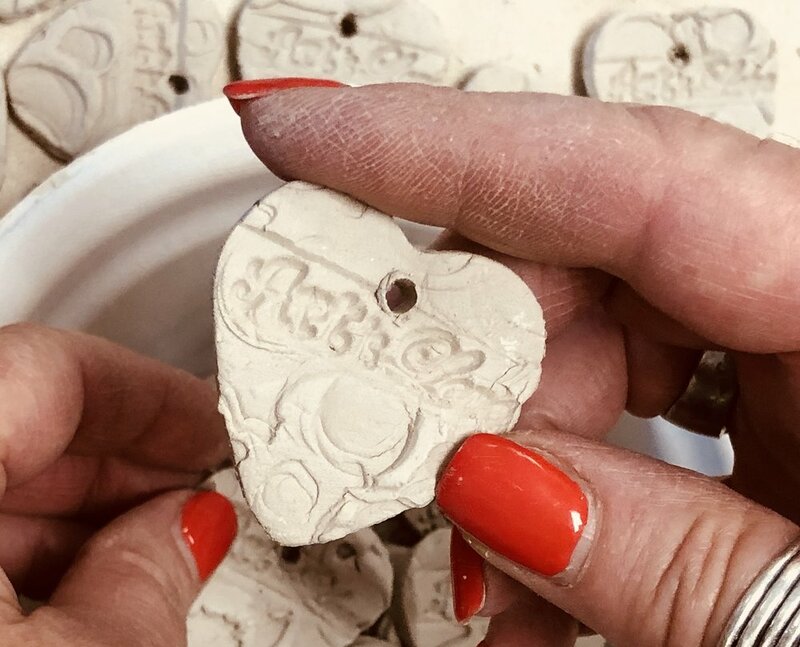 The glazing "experts" who are now working on their prints can pause to give those new at glazing a few tips.."Three coats of each color, "..."Use the gouge if you're doing sgraffito."... "Dark glaze goes over light better than light over dark." While all of this peer tutoring is going on, I'm supervising and deferring questions to the experts when possible, and enjoying every minute of it! Peer tutoring reinforces the processes and techniques to those tutoring. Peer tutoring also helps those learning better understand the instructions. Peer tutoring may also inspire a future in art educator. At the end of class, one "expert" approached me and said, "Whew! I am exhausted...Now I understand what you go through. Teaching is hard and sometimes they don't listen.." So, think I should tell that student about Differentiated Instruction? There is a new "tradition" with artists in my Middle School Art Classes. It is known as "Writing on Wednesdays." They know that on Wednesdays they have the green light to bring their laptops to explore a new painting specifically chosen for it's era or style. Sixth Grade (since I only have them for 9 weeks) is exploring the Impressionist Period. Since I have Seventh and Eighth Grade Students every day all year, Seventh Grade is working it's way through Post-Impressionism through Pop-Art and Eighth Grade is looking at Pop-Art through Contemporary Art. The writing formats vary from a formal critique (A.K.A. Art Investigation) to prompts in which students might write a letter to a friend describing a painting, write a short story based on a painting, or even write Haiku based on experiencing a painting using their five senses. If students are in the middle of an art process mid week and unable to pause, we might choose to have Writing on Wednesdays on...a Friday or Monday. Last Wednesday, I was not prepared for what transpired during my Sixth Grade Art Class! I put students in Investigating Teams. Using a handout which I created, students were to observe the "evidence" of Renoir's Luncheon of the Boating Party and collect their data. What ensued was a very passionate argument regarding the content of the painting. It was wonderful. I tried hard not to smile too much. I don't think I'll ever have to remind them again who painted it or what it looks like. As students were leaving one student turned to me and said, "I love Writing on Wednesdays, Mrs. Weintraub! It's so much fun!" What's fun for me is seeing these future Artists, Lawyers, Teachers, and Doctors connecting to Art in a whole new way. So, one day, maybe 20 years from now, when they are walking through the Art Institute of Chicago they just might take a second look at certain Renoir. I've taught Middle School Art for many years. I've seen my teaching evolve from just teaching students how to make or draw things into why to make and draw things. In order to teach them "why" sometimes I must help them look at issues that they face and how those issues are connected to issues facing our world. 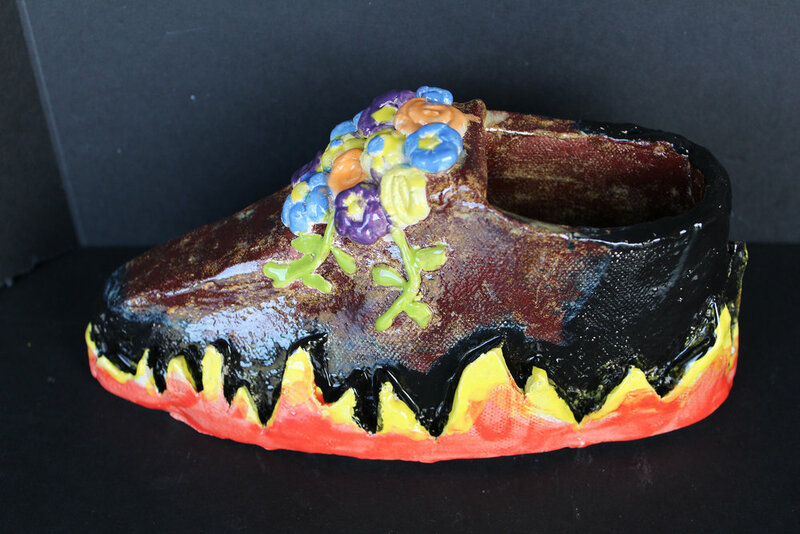 For many of these students, this is the first time they have considered that their art could be used to communicate something that they are passionate about. I feel a responsibility to teach them the skills necessary to communicate this message. I believe that craftsmanship in art is as important as good writing and delivery is in a powerful speech. It needs to be consistent with the message and not distract from it. Showing them examples of art speaking they can see the variety of ways that other artists have communicated; Picasso's "Guernica," Ringgold's, "For The Women's House," Goya's "The Third of May 1808", for example. While exploring issues, I write down these themes on the board. This way students also learn the importance of conversation. I have seen them then begin to use this tool of collaborative exploration in constructing their own art. Sometimes they will even ask other students to help them develop ideas. I am always amazed at the results. Recently a student decided to explore the theme of "addiction," in creating his self-portrait. The result was a tonal portrait of himself chained inside a doorway but reaching to the outside where in the reflection of his glasses we see the colors of a beautiful day. One of the chains is broken. It is about gaining freedom from his addiction to video games, and wanting to play outside with his friends. What a transparent and powerful message from an 8th Grade student! But then so is the simplest of designs like the one carved on a ceramic cylinder--"World Peace." Theodore Roosevelt once said that, "People don't care how much you know until they know how much you care." Perhaps the best way we can teach students to care is by starting conversations and listening to them.